Holly is a shrub in the Aquifoliaceae family of plants, and it is typically characterized by its red berries, dark green leaves and small pale flowers. According to the Flower Essence Society, unlike most other types of bushes and shrubs, holly plants have a tendency to form well-defined central stems. In areas without much large plant growth, they will even develop into full-sized trees. Some of the most common varieties include American, Japanese, Chinese and blue holly. American holly (Ilex opaca) is dioecious, which means that its plants will produce either female or male flowers. 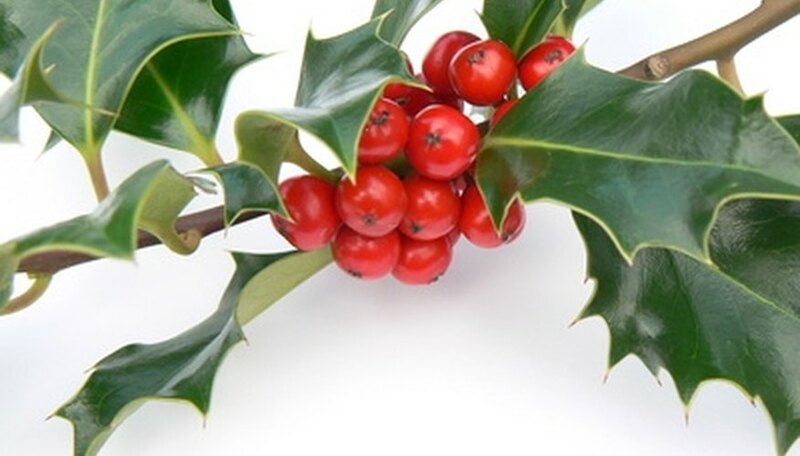 The holly is also referred to as the Christmas holly, as individuals commonly use its berries and evergreen foliage as decorations for the winter holiday. According to Duke University, the holly's leaves are typically separated into four different segments and feature spiny teeth. However, in rare instances, the leaves may have five segments each and/or lack prickly edges. According to Ohio State University, Japanese holly (Ilex crenata) is a dioecious shrub that commonly grows to be between 3 and 10 feet tall. It is characterized by having black berries and spineless leaves (which are relatively small, in comparison to the leaves of other holly species). While the tops of the leaves are dark green, the bottoms are spotted with clear or blackish glands. The flowers of the Japanese holly are inconspicuous, and are generally a pale greenish white in color. Chinese holly (Ilex cornuta) plants feature very distinctive leaves. According to Duke University, while the central spine of each leaf angles downward, the next two spines, which branch off of it, angle upwards. This makes the leaves appear as though they have horns (hence the Latin species name cornuta, which means "with horns" or "horned"). The leaves of the Chinese holly are also known for being glossy, leather-like and prickly, as are the majority of American hollies. According to Duke University, the flowers of the holly are usually a yellowish white and grow in dense bunches. According to Ohio State University, blue holly plants (Ilex x meserveae) are dioecious hollies that are well known for their spiny leaves, which are a distinctive bluish green in color. However, the leaves usually start out as a light green or bronze color and then grow darker with age. Female blue holly plants are also characterized by producing showy, bright red berries, according to Ohio State University.